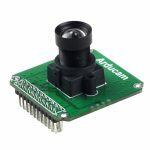 Arducam now provide low cost high frame 0.3MP global shutter camera module basd on ONSemi (used to be Aptina) MT9V022 (monochrome) and MT9V034 (color) image sensor. 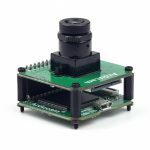 The Aptina® MT9V022/MT9V034 is a 1/3-inch wide-VGA format CMOS active-pixel digital image sensor with global shutter and high dynamic range (HDR) operation. The sensor has specifically been designed to support the demanding interior and exterior automotive imaging needs, which makes this part ideal for a wide variety of imaging applications in real-world environments. The active imaging pixel array is 752H x 480V. It incorporates sophisticated camera functions on-chip—such as binning 2 x 2 and 4 x 4, to improve sensitivity when operating in smaller resolutions—as well as windowing, column and row mirroring. 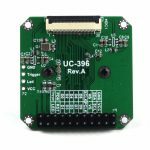 It is programmable through a simple two-wire serial interface. The MT9V022/MT9V034 can be operated in its default mode or be programmed for frame size, exposure, gain setting, and other parameters. The default mode outputs a wide-VGAsize image at 60 frames per second (fps). An on-chip analog-to-digital converter (ADC) provides 10 bits per pixel. A 12-bit resolution companded for 10 bits for small signals can be alternatively enabled, allowing more accurate digitization for darker areas in the image. 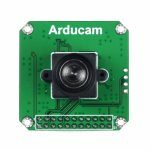 Arducam created Arducam USB camera shields for MT9V022/MT9V034 camera module which support both Windows and Linux using C/C++, Python programming languages, as well as Opencv supports.